Neil Calder, Head of ITER Communications, demonstrating the sonic do-it-yourself "fusion kit". 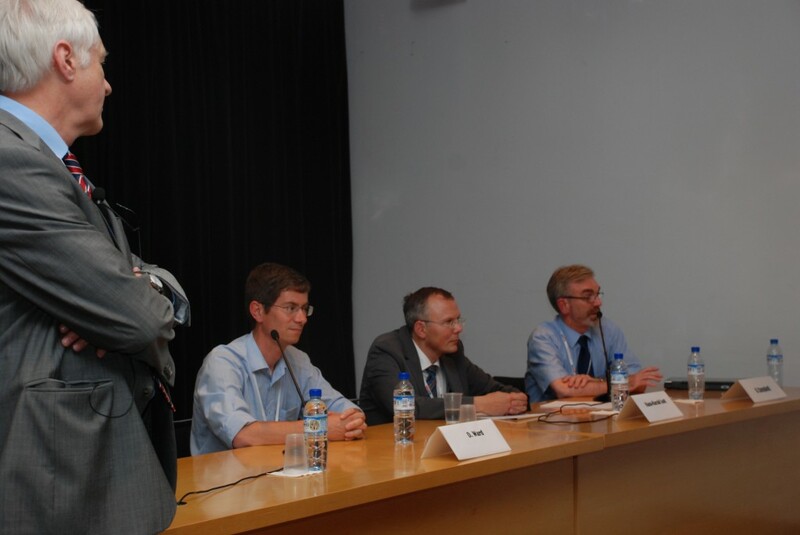 Discussing the fusion quest: David Ward, Harald Bolt and David Campbell (left to right). Barcelona is always worth a visit. 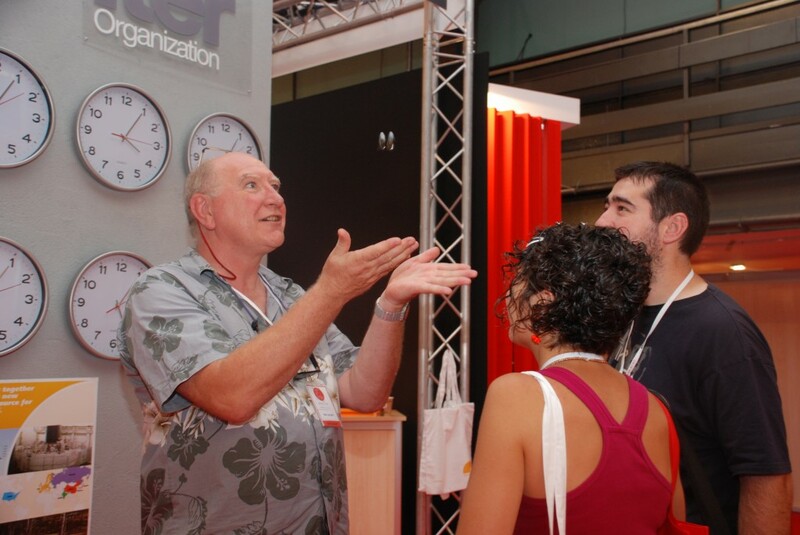 For scientists, young researchers and policymakers it was a must to travel to the Catalan capital as the European Open Science Forum (ESOF), Europe's biggest science fair, was held there this year. 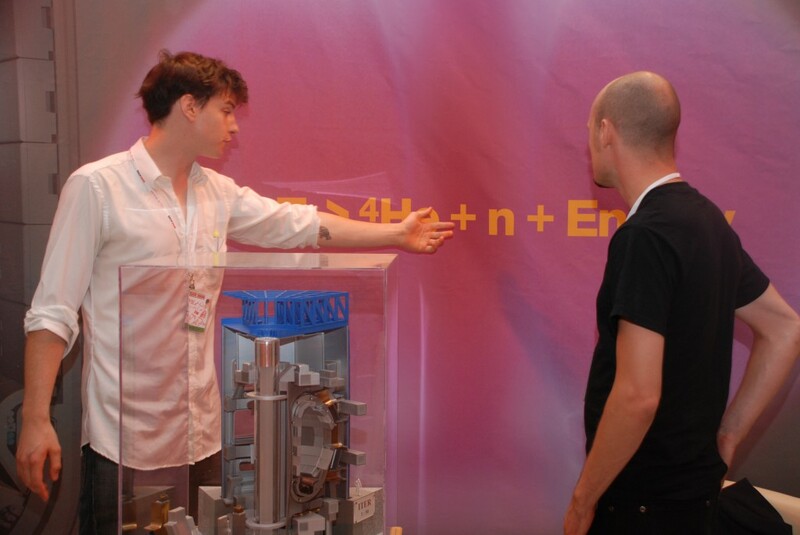 The ITER Organization was represented with its own exhibition stand, as was the European Domestic Agency "Fusion for Energy". And the response was impressive. In a special and well-attended session on Friday afternoon chaired by Friedrich Wagner, three leading experts on fusion tried to find an answer to the provocative question whether fusion will always be 40 years away. "Fusion was only seriously pursued as a result of an oil crisis", David Ward from the UKAEA replied. Given the necessary funding, fusion could deliver power to the grid in less than 30 years, he stated. Great interest was shown in the introduction to the ITER project presented by David Campbell, ITER Assistant Deputy Director General, and the progress made in fusion material research presented by Hans—Harald Bolt from the Research Centre in Julich, Germany. Questions covered such subjects as how to extract energy from the Tokamak, the number of fusion power plants that would be needed to meet 80% of our future energy needs and the reasons for no private funding to date.